Some people touch us through the power of their personalities, their capacity to articulate their convictions with strength. We notice them; we listen to them. That was never Mary’s way. She rather provided a gentle, unthreatening climate whenever she was present. Mary was a listener, not a talker, and wouldn’t the world be a better place if more people listened to one another with her openness and gentle receptivity. Mary Mackert was born on August 6, 1932, in Springfield, Ohio, to John and Clara (Wagner) Mackert. John and Clara had three children in all: a baby boy who died at three days old, Mary, and then Peter two and a half years later. When Sister Mary was in second grade, the family moved to Berea, Ohio, where they lived in a rural setting with two orchards and a vegetable garden and raised some chickens. She attended a two-room schoolhouse operated by the Sisters of the Incarnate Word. The family moved to Detroit when Sister Mary was ten years old. John was a machinist, and Sister Mary said in her autobiography that while he did not talk about his work she suspected it had something to do with the war effort. 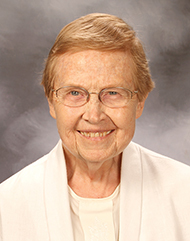 She spent the rest of her primary education at Assumption Grotto in Detroit, taught by the Racine Dominican Sisters, and for high school went to Dominican High School, where she met the Adrian Dominican Sisters.